Tourism Research Australia published its annual assessment of Australia's tourism industry reviewing performance for 2013-14 and highlighting longer-term issues that are likely to affect its performance. Australia’s tourism industry triumphed in 2013–14, with record-breaking arrivals and expenditure results. Despite weak global economic growth over the last five years and a high Australian dollar, the industry has shown its resilience. 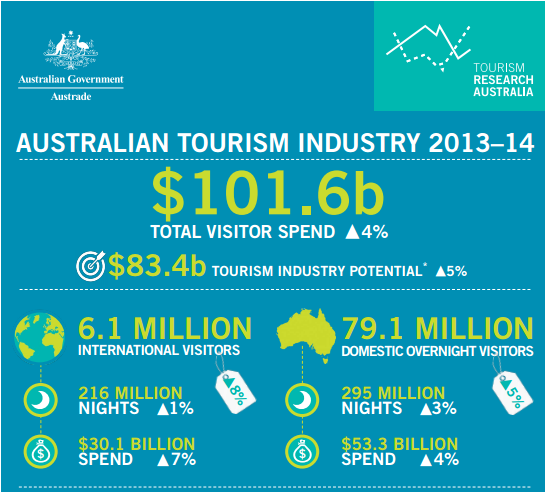 Australia’s tourism industry performed well during 2012–13. Total visitor expenditure grew 3.9 per cent to $97.7 billion. Domestic visitor expenditure continued to increase, up by 3.2 per cent in 2012–13 to $69.5 billion—double its long-term growth rate—and international visitor expenditure increased 5.9 per cent to $28.2 billion. Asia continues to be an important driver in the Australian economy and Chinese visitors provided almost half of the growth in international visitor expenditure in 2012–13. According to the BECA 2012 State of the Industry Report, 190,000 people visited Australia last year to attend a conference or convention, up 11 per cent on 2011. New Zealand remained the major source of conference visitors, with numbers rising 2.5 per cent since 2011, while convention visitors from the USA grew 26 per cent, numbers from China increased 23 per cent and Japanese arrivals rose 16 per cent. At the same time Australia’s market share of international association meetings increased to a ranking of 13th in 2012 compared to 16th in 2011. The report showed a decrease in the deficit between inbound and outbound convention travel with a 10 per cent rise in arrivals and a 3 per cent decrease in departures. The 2011 report demonstrates a strengthening of the industry in numbers of travelers with International business event visitor spend in Australia (IVS) increasing by 15% and Domestic overnight business event visitor spend (NVS) increasing by 19%. However it also shows a weakening in State Government funding support of the Convention Bureaus by 28% and this is reflected in the increase in lost bids (5%) and the reduction of successful bids (12%). The coloration between the two clearly demonstrates the impact Government support has on the ability of the States to attract business events. The Australian economy was less affected by the GFC and most of its economic indicators rebounded quite strongly in 2010. The fact that the Australian dollar appreciated against leading currencies during 2010 posed serious challenges for inbound tourism and business events. This contributed to the further widening of the ‘business events deficit’ with the number of Australians going overseas to attend a conference or convention being some 25% higher than the number of internationals coming to Australia for the same purpose. Site Map | Contact Us Copyright © 2011 Business Events Council of Australia. All rights reserved.